This month nearly half of the student body at one Ohio elementary school was infected with the norovirus (see: Fox News). There was a Norvovirus outbreak in Fanling, Hong Kong (see press release). One international cruise ship reported an incidence too (see report). There were many less documented cases (according to one of the recent sufferers, "you go to Facebook and everyone’s status is either ‘sick’ or ‘recovering’"). Almost every hour someone twits about stomach that hurts or other signs of food poisoning. How are gastrointestinal outbreaks defined? Food-borne disease outbreak is an incident in which two or more persons experience a similar illness after ingestion of a common food or meal. Waterborne outbreaks may be associated with drinking water or with recreational water. Non-foodborne, non-waterborne outbreaks are defined as two or more cases of illness related by time and place in which an epidemiologic evaluation suggests either person-to-person transmission occurred or a vehicle other than food or water (e.g., animal contact) is identified. This category also includes outbreaks for which the route of transmission could not be determined. Better detection of gastrointestinal outbreaks is possible if crowdsourcing is utilized. 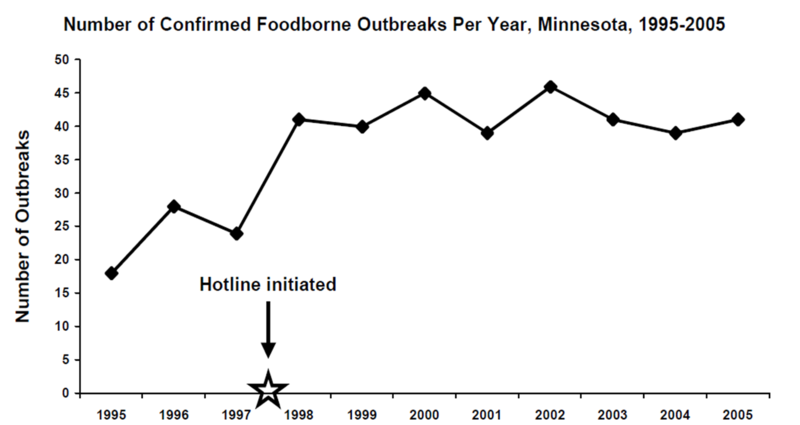 |For example, in 1998, the toll-free MDH foodborne illness hotline (1877-FOOD-ILL) was implemented in Minnesota. 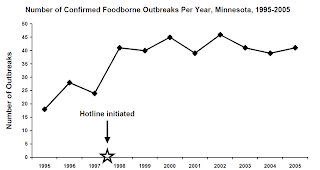 In 2005, 35 (85%) of the 41 confirmed foodborne outbreaks were initially reported to MDH or local public health agencies via phone calls from the public; the remaining six outbreaks were identified through active laboratory-based surveillance for bacterial pathogens. According to Minnesota Department of Health (see Outbreak Statistics: Summary of Gastroenteritis Outbreaks in Minnesota) of the 41 confirmed foodborne outbreaks, 28 (68%) were either laboratory-confirmed (n=26) or epidemiologically defined (n=2) outbreaks of norovirus gastroenteritis. There were five (12%) confirmed foodborne outbreaks caused by Salmonella, one (2%) caused by E. coli O157:H7, one (2%) caused by scombroid toxin, and one (2%) caused by escolar toxin. The remaining five confirmed foodborne outbreaks (12%) were classified as bacterial intoxications (caused by Clostridium perfringens, Staphylococcus aureus, or Bacillus cereus). Norovirus is a leading cause of food-borne disease outbreaks in the United States. The importance of norovirus as a cause of foodborne disease outbreaks in 2005 continues a pattern that has been observed for over two decades in Minnesota. During 1981-2005, 291 (50%) of 586 confirmed outbreaks of foodborne disease were due to norovirus, while 118 (20%) confirmed foodborne outbreaks were caused by infectious bacterial pathogens such as Salmonella and E. coli O157. Therefore, over this 25-year period the combined number of foodborne outbreaks due to infectious bacterial agents was less than half the number of foodborne outbreaks due to norovirus. Many outbreaks of norovirus are due to ill food workers handling ready-to-eat food items such as salads and sandwiches in restaurant or catering settings. In other foodborne norovirus outbreaks, ill or convalescent individuals contaminate shared food (e.g., self-serve food items in a wedding reception buffet or school cafeteria). Prevention of further disease transmission during norovirus outbreaks is accomplished by emphasizing good handwashing procedures, minimizing bare-hand contact with ready-to-eat food items, minimizing environmental contamination, and excluding ill employees from work until 72 hours after recovery. There were five confirmed foodborne outbreaks caused by Salmonella in 2005. Two of the outbreaks were associated with commercially distributed, frozen, stuffed, microwaveable chicken entrees. One salmonellosis outbreak was associated with cake batter ice cream sold at a national retail ice cream chain and involved cases in multiple states. One salmonellosis outbreak was linked to pork or cilantro sold at grocery stores. One salmonellosis outbreak was associated with a restaurant. The causes of restaurant outbreaks of salmonellosis are often complex and can involve consumption of undercooked foods of animal origin, infected foodhandlers, cross-contamination between raw and ready-to-eat foods, environmental contamination, and inadequate cooking, hot holding, cooling, and reheating of multiple food items. MDH identified one foodborne outbreak caused by E. coli O157:H7 in 2005. This outbreak was associated with prepackaged, prewashed lettuce salad that was distributed to multiple states. Five of the confirmed foodborne outbreaks identified in Minnesota in 2005 were bacterial intoxications caused by pathogens such as Clostridium perfringens, Bacillus cereus, and Staphylococcus aureus. These outbreaks often lack laboratory confirmation, as the resulting illnesses typically are of short duration. A recurring theme in outbreaks of bacterial intoxications is improper time and temperature control of potentially hazardous food items such as meats, rice, and sauces. There were four waterborne gastroenteritis outbreaks identified by MDH in 2005. All involved recreational water; three were associated with lake beaches and one with an indoor swimming pool. The three outbreaks associated with lake beaches had a known etiology (E. coli O157:H7, Shigella sonnei, and norovirus, respectively). There were 39 non-foodborne, non-waterborne outbreaks of gastroenteritis identified in 2005. The majority of outbreaks in this category were associated with person-to-person transmission of enteric pathogens, predominantly norovirus, in nursing homes, schools, daycares, and other facilities. For reasons that are unclear, most norovirus outbreaks in nursing homes occur during the winter months. Today FDA approved marketing of Ridascreen Norovirus 3rd Generation assay - first test for gastroenteritis outbreaks. Not sensitive enough for individuals, this screening procedure could be used when a number of people have simultaneously contracted gastroenteritis, for identification of food-borne disease outbreaks. The Ridascreen Norovirus 3rd Generation EIA assay is for use when a number of people have simultaneously contracted gastroenteritis and there is a clear avenue for virus transmission, such as a shared location or food. We are still a while away from getting it under control, but t's good to see progress. Hopefully there will be more developments in diagnostics tools and better crowdsourcing platforms. good rendition to take and send Breezes of yourself unless Snapchat Online This choice provides you the capability to configuration nice. good Google account in the Andy software to allow Click Sync WhatsApp application to your Applications folder, however before nice. this assignment help service offers support to student for most complicated subjects.